It was stressed in this same report that these “Guf” students were like students of any other University; just because they had a “national” feeling perhaps more pronounced to them as a whole, they were not “nationalistic” in the modern sense of a fascist organization. During their visit, the Italian students invited the American university students to come to Italy for the opening of the University City in Rome. When the Italian students met with Penn Vice President George W. McClelland, in the Palestra (pictured at the top of the page), Peter Ubertalli, the spokesman of the group, stated that the visit should be reciprocal. Penn students were welcome to come see the new “Citta Universitaria.” During November of 1934, the Italian operetta”La Geisha,” composed by Sydney Jones, was presented by the Italian Club in Irvine Auditorium. During World War II, Italy joined the Axis powers with Germany and Japan. After the Axis defeat in 1945, the United States aided Italy during the post-war period and that nation, as the First Italian Republic, started to revitalize economically. Italian cultural events were not revived on the Penn campus until the 1960’s but then occurred frequently throughout the 1970s and 1980s. 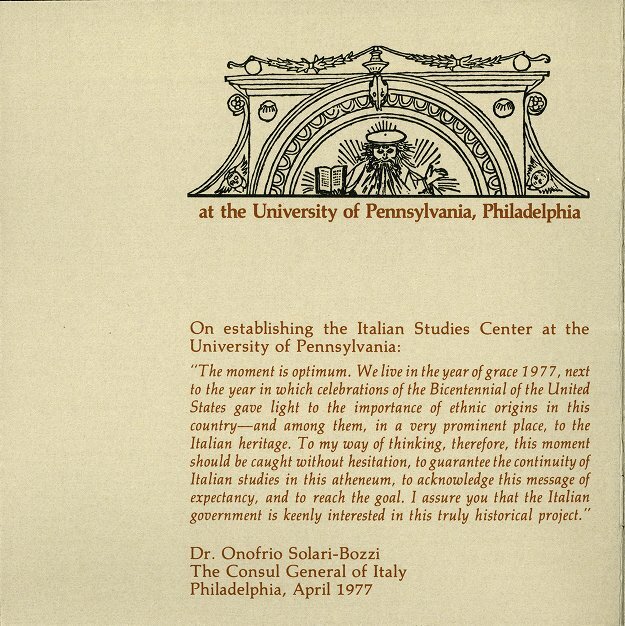 In early winter, 1961, in the University Museum auditorium, Filippo Donini, then the Director of the Italian Cultural Institute in New York and a graduate of the University of Rome, arrived at Penn to speak on “The Resurgence of Italian Poetry.” This was part of a greater effort at Penn to participate in the Festival of Italy of the City of Philadelphia. Sponsored by Circolo Italiano and the Department of Romance Languages, the Italian Consul-General, Count Edgardo Sogno del Vallino, introduced the guest speaker. That same year marked the 100th anniversary of Italian unification. Penn, specifically those in Circolo Italiano and the America-Italy Society, was addressed by Dr. Ugucione Ranieri di Sorbello, a representative of the Italian government to the United States to speak on the subject of Italian unification. After one hundred years, di Sorbello told the Penn campus that unification meant a “change of a way of life in Italy.” Vallino, mentioned earlier, also spoke with di Sorbello at the presentation. A number of smaller events occurred in early 1963. The Consul-General of Italy, Dr. Gian Piero Nuti was honored at Penn by Il Circolo Italiano. The Dr. Domenico Vittorini Scholarship was presented, honoring the memory of Vittorini, a Penn associate professor who had died five years earlier. The scholarship would allow a Penn student studying Italian to study in Italy for an academic year. 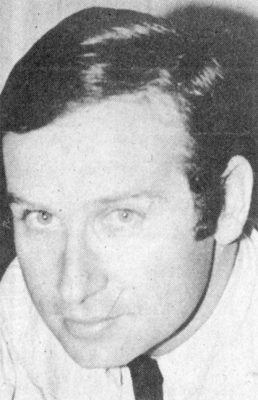 In 1971, Penn professor Jerre Mangione (whose parents hailed from Sicily) was awarded the title of Commendatore in the Order “star of Italian Solidarity.” It was awarded by the First Republic of Italy under President Giuseppe Saragat, and presented by Dr. Antonio Carloni, the Consul General of Italy in Philadelphia. In an article on this event, it was reported that Carloni stated to Saragat that “[t]his decoration is awarded to you in recognition of your long activity as a writer and lecturer devoted to making Italy, the country of origin of your parents, better known and respected in the United States.” In the summer of 1973, Penn scientists worked in Lead, South Dakota, with scientists from the University of Texas and the University of Turin, Italy. The results of this effort would be used with findings from the Mont Blanc Tunnel on the French and Italian border to further the study of the core energy of stars. In 1979, in Houston Hall, University of Rome professor Gian Vittorio Caprara decried the violence of Italian society. In a speech entitled “The Politics of Violence: The Case of Italy,” he spoke on the issues of Italian violence in the late 1970s. This was the first event sponsored by the Italian Studies Center, a fact of which Mangione was quite proud. In tribute to the Italian film director Luchino Visconti, the Italian Studies Center with the Annenberg School of Communications sponsored a preview to the late director’s last work, The Innocent, at the Zellerbach Theatre, and later a Philadelphia screening of four of Visconti’s works in March 1979. That same spring, the America-Italy Society of Philadelphia began awarding Vittorini Fund Prizes for successes in Italian course work, and the Italian Studies Center hosted the Mayor of Florence, Italy, Elio Gabbuggiani and his wife for that year’s Penn commencement program. At the Wharton School in November 1979, Giacinto Militello, then the head of the largest Italian labor union, International Relations of CGIL, gave a speech sponsored by the Italian Studies Center. On November 29, 1979, a medal was awarded by Provost Vartan Gregorian to Dr. Domenico Fazio, the Director General for University Instruction of the Italian Ministry of Education. 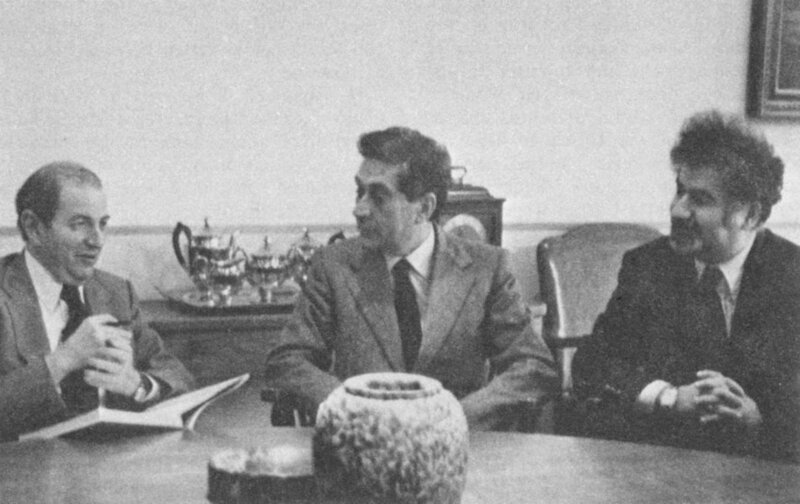 In his acceptance of the medal, as reported in the Almanac of December 6, 1979, Fazio spoke about how Italian universities and American institutions should keep working towards “build[ing] a strong cultural bridge.” Many other notable Italians were present at the ceremony, including the Consul General of Italy, Dr. Giancarlo Riccio, the Director of the Budget Office in the Ministry of Education, Dr. Giovanni D’Addona and the Director of the San Gallicano Research Institute in Rome, Dr. Ferdinand Ippolito. Also present was Dr. Giuliano Sorani, who was then the Rector of L’Aquila University. This is significant because Penn had signed an exchange agreement for students and faculty with that institution. Fazio went on to speak with Penn President Martin Meyerson and Provost Vartan Gregorian about Penn’s Italian Studies Center. 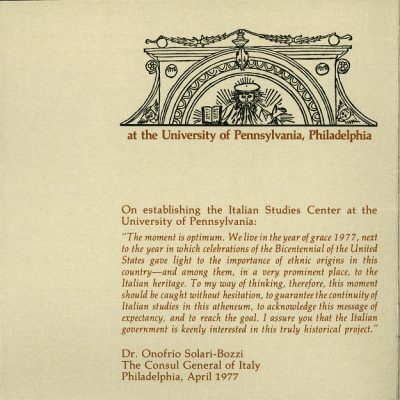 In the summer of 1980, some Philadelphians paid a visit to the Italian Consulate to express their wish to continue Penn’s Italian Studies program. They wanted to form an organization called “The Amici” to help fund the Italian Studies Center. This was not a plan for a new campus organization; rather this organization would act as the intermediary between Penn and the Philadelphia community. The Philadelphia community was not alone in its interest in Penn’s Italian Studies program; the Italian Government gave a $200,000 grant to the Center, to be matched by Penn, to develop another exchange program. Penn had become well-known for Italian studies on the campus, and as of 1980, there were about seventy courses relating to the subject each year. The University of Pennsylvania also had developed a Master’s Degree Program and a Doctorate Program in Italian Language and Literature and had joined in a consortium of American universities to allow students to spend a year at the University of Bologna. This “Bologna Program” was also co-sponsored by the Italian Studies Center. At the present time, the Center for Italian Studies remains strong.